What's new in Music Cognition and Cognitive Science? "Why should music be of interest to cognitive scientists, and what role does it play in human cognition? We review three factors that make music an important topic for cognitive scientific research. First, music is a universal human trait fulfilling crucial roles in everyday life. Second, music has an important part to play in ontogenetic development and human evolution. Third, appreciating and producing music simultaneously engage many complex perceptual, cognitive, and emotional processes, rendering music an ideal object for studying the mind. We propose an integrated status for music cognition in the Cognitive Sciences and conclude by reviewing challenges and big questions in the field and the way in which these reflect recent developments." Interested in a PhD or Postdoc position? As of today, Leiden University, University of Amsterdam, and the Meertens Institute are looking for several PhD and Postdoc candidates for an ambitious research project starting February 1, 2013. In various domains of cognitive science, a new paradigm holds that humans and non-human animals are born with a small set of hard-wired cognitive abilities that are task-specific, language-independent, and non-species-specific. These core knowledge systems are innate cognitive skills that have the capacity for building mental representations of objects, persons, spatial relationships, numerosity, and social interaction. In addition to core knowledge systems, humans possess species-specific, uniquely human abilities such as language and music. Deadline for applications: 23 November 2012. For more information see research proposal. A new vocal learner found? In a recent study by Timothy Holy and Zhongsheng Guo (Washington University) it was suggested that male mice produce vocalizations that are songlike, in the sense that they have a melodic structure, sequential and repetitive use of ‘syllables’ (as opposed to what can be called ‘calls’) that are combined in a non-random fashion with repeated motifs. And all this in the ultrasonic domain. Example of a male adult mouse song (from Arriaga et al, 2012). This discovery opened the question of whether mice share any behavioral and neural mechanisms for song production and learning with the set of rare vocal learning species, which includes three groups of birds (songbirds, parrots, hummingbirds) and several groups of mammals (humans, cetaceans [dolphins and whales], bats, elephants, and pinnipeds [sea lions and seals]). In a study that appeared in PLoS ONE two days ago, co-authored by Gustavo Arriaga, Eric Zhou and Erich Jarvis (Duke University), it was shown that a motor cortex region in mice is active during singing, and that it projects directly to brainstem vocal motor neurons that is necessary for keeping song more stereotyped and on pitch. 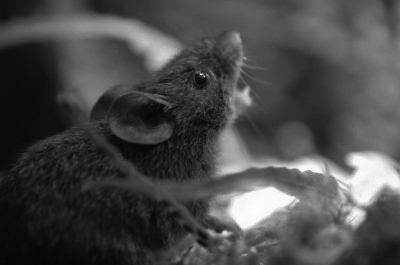 The Jarvis research team also discovered that the mice depend on auditory feedback to maintain some ultrasonic song features, and that sub-strains with differences in their songs can match each other’s pitch when cross-housed under competitive social conditions. It was concluded that male mice have some limited vocal modification abilities with at least some neuroanatomical features thought to be unique to humans and song-learning birds. In short: vocal learning seems not so much a species-specific characteristic, present in three groups of birds and several groups of mammals, but more likely to be a continuum. Many studies on the origins of music concern the question of what defines music. Can birdsong, the song structure of humpback whales, a Thai elephant orchestra, or the interlocking duets of Gibbons be considered music? In trying to answer this question, it is important to separate the notions of ‘music’ and ‘musicality’, with musicality being defined as a natural, spontaneously developing trait based on and constrained by our cognitive system, and music as a social and cultural construct based on that very musicality. Other studies are concerned with thinking about the question what we share with other animals in terms of musicality. And indeed, no matter how we would like it to be different, we are repeatedly reminded that we have more similarities to nonhuman animals than differences. However, we must be careful in calling birdsong or a chimpanzee’s drumming on an empty barrel, music. We make this mistake more often. We, the human listeners, perceive the sounds made by songbirds, whales, or chimpanzees as music. Whether these other animals also do that is unclear. And that makes a world of difference. A few weeks ago an interesting study appeared in Animal Behavior on the often used example of the song of a nightingale that can be considered to be impressively musical. 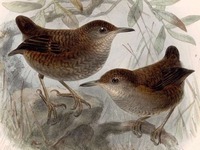 In that study ecologist Marcelo Araya-Salas (New Mexico State University in Las Cruces) shows that the resemblance between a nightingale wren's song and music is nothing more than a coincidence. Out of the 243 comparisons Araya-Salas made between nightingale wrens' songs and musical scales, only six matched harmonic intervals. Despite the beauty of birdsong, it’s again an example that when we call something music we’re projecting our own biases. Nothing wrong with that at all, but good to realize. Rothenberg, D. (2005). Why Birds Sing: A Journey through the Mystery of Birdsong. New York : Basic Books. P.S. In the context of earlier discussions on tuning systems (e.g., see blog entry): this study suggests that we might actually not be so sensitive to tuning as we might think.